Panorama UI is now active by default for users on all supported operating systems. For a limited transition time users can opt into backwards compatibility mode by adding -scaleform launch option. Planted C4 will now emit a different beeping sound when planted at bombsite B.
Molotovs and incendiary grenades will now consistently deal impact damage to match other grenades. Players using the CS:GO Perfect World launcher now have fully localized voice audio. Community servers now allow connections from players using the CS:GO Perfect World launcher and other launchers. 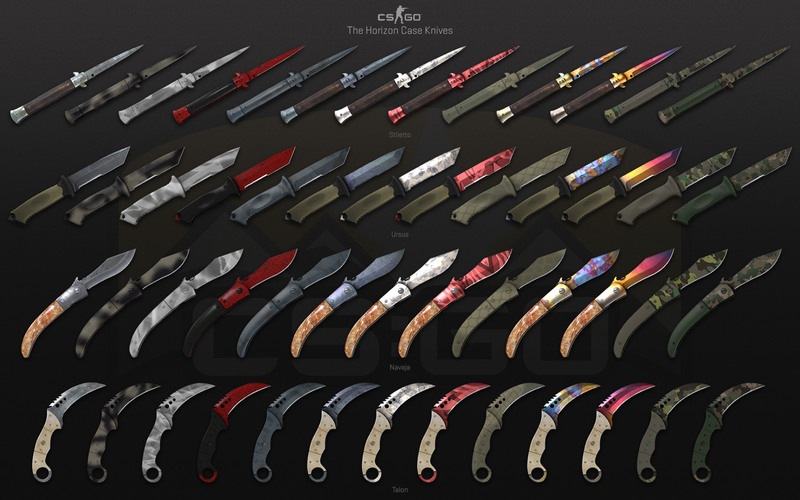 Added the Horizon Case, featuring 17 new community weapon finishes and 4 brand new knives. Fixed halftime and team selection music to respect main menu music volume settings. Lobby voice chat will now duck main menu music volume for the duration of voice chat. Fixed ability to borrow music kits and added a button to stop borrowing music kits. Fixed a bug that caused old invites to be re-sent when returning to lobby from a competitive match. Friends rich presence in-game now displays the competitive match score first. Added chat messages for players receiving competitive cooldowns, reports, and commendations. Multiple fixes for IME support and text entry focus with IME. Updated lobby chat to show more messages. Fixed Lobby chat layouts for 4×3 and 5×4 aspect ratios. Fixed end of match rank display showing incorrect text for 40+ level ranks. Fixed reconnect panel layouts for 4×3 and 5×4 aspect ratios. Fixed scoreboard layout in war game modes. Improved visual separation of observers in the scoreboard. Fixed the spectator round timer sometimes getting stuck red. Fixed missing kill feed icons. Fixed radar and map overviews for workshop maps that don’t have a manifest file with radar data. Fixed workshop maps selection screen in Wingman mode. Impact kills with molotovs and incendiary grenades now display an icon in the kill feed. Fixed various mistakes on the new radar map overviews (thanks Yesber). Added fallback parameters to Overpass water material to fix stale reflection data. Added rare inspect animation to Desert Eagle. Miscellaneous stability and security fixes.